You needn’t be dyeing gray hair forever . . . Here’s how to go natural! Naturally dark hair has the tendency to turn to beautiful shades of silver and white, however, genetics play a role here. If you were fortunate enough to see your parents through the process of going gray, it will give you the best road map on when and how your hair will likely gray. I’ve found that most women turn gray similar to the way their Mother’s and Grandmother’s did. You are not in a ‘dream’ world believing that a beautiful white hair color is attainable, however you may need a little help getting it there. It sounds like you are not seeing ‘roots’ in the front and if that’s the case, you will be able to get to white more quickly. Your natural dark hair in the back can make for a gorgeous contrast, and it’s the way most women gray naturally. Here are a couple of suggestions for transitioning your blonde dyed hair to white or naturally gray hair. Shorten your hair as much as possible. Shorter hair will make for a quicker transition while keeping your hair healthier in the process. Start a process to lift the blonde out by gently bleaching in many foils with fine sections. Repeat foils in 4 to 6 weeks and tone with a violet based gloss or color shampoo to reduce any yellow. Cut hair and repeat foils till hair is white. If you have dark roots in the front or on top, your hair has not turned completely gray or white yet. You could bring your hair to its natural color by following these steps. Cut hair short for a quicker blending of your old hair to the new regrowth. Foil in low-lights with semi-permanent hair color that matches your regrowth. A semi-permanent hair color will stain the gray and the foils will reduce lines of demarcation as your natural hair color grows in. An experienced hair colorist can determine your best options by looking at your regrowth, so allow your roots to grow in about an inch before having a consultation. If your colorist is unsure on how to get you through this, do some due-diligence and find one who is confident and knowledgeable. Don’t simply assume that anyone who colors hair, has the knowledge it takes to bring you through this transition. If you suspect hesitation on their part . . . look elsewhere. 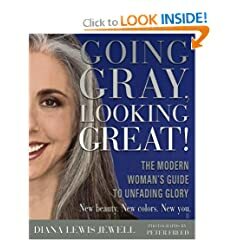 Going Gray, Looking Great, by Diana Lewis Jewell, is a great book on this topic. Gray Hair; Wonder if People Would Treat You Different? 6 Gray Hairstyles Worth Stealing! June 2, 2014 By: Barb Quinn Leave your comments (5), Your input matters. My colorist daughterinlaw says to put demipermanent blonde that will wash out as the gray grows out. I use Shimmering Light (Ithink) shampoo (its purple) a couple of times a week for the gray. Its growing out gorgeous. Thank you for your comment Stacey. We are pleased to hear that you enjoyed the article. Check out the article How to Grow Out Grey Hair for more wonderful ideas. Really neat article post. Would like more. I have red hair that is quickly going gray. I’ve been coloring it for quite a few years, but am considering letting it go. Would I just use lighter and lighter shades of red going to blond letting it go? what’s the best way to let it go gray without being abrubt?